Despite my complaints about how the recipes are written, Agatha Kulaga and Erin Patinkin’s cookbook Ovenly (Harlequin, 2014) does contain enough interesting recipes to make it worth the cost. I’ve already done their Black Chocolate Stout Cake twice, I did two of their brownie recipes for Browniefest, and I have no doubt that I’ll get around to trying their shortbread variations at some point — but the last of the recipes that I marked in my initial scan of this cookbook was “Gooey Honey Blondies” (p. 131). They were indeed gooey, despite not having a huge amount of honey, and they were a pretty big hit in the office when I brought them in. Mine didn’t look very much like the photo shown in the cookbook — they are more chocolatey, perhaps because I followed their “advice for chocolate lovers” and added 50% more chocolate chips. In any event, this is a super-easy dessert to make; here’s the whole process in only seven photos. We start as always with the mise en place. 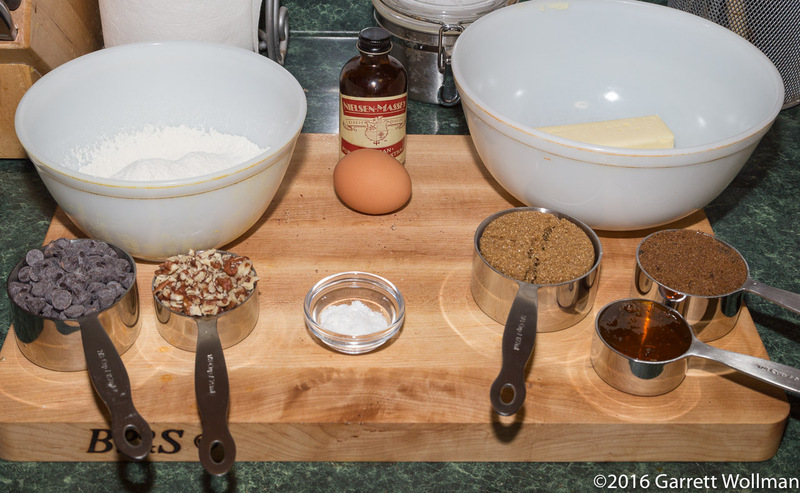 Clockwise from upper left: 130 g all-purpose flour, pure vanilla extract, a large egg, 5 oz (140 g) unsalted butter, 120 g dark muscovado (my favorite style of dark brown sugar), 90 g (¼ cup or 60 ml) honey, 110 g light brown sugar, 5 g fine sea salt, 45 g chopped untoasted pecans, and 120 g (about ¾ cup) bittersweet (at least 60% cacao) chocolate chips. Note that there is no leavening of any kind, and the butter is in a microwave-safe bowl for melting, so these blondies will be quite dense. 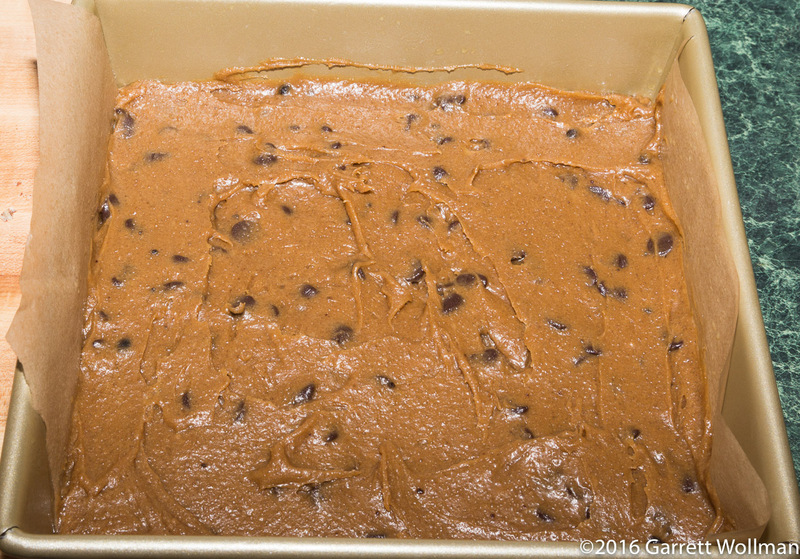 The blondies are baked in an 8″×8″ (205×205 mm) square baking pan. Rather than the butter and flour preparation the recipe calls for, I made a parchment sling and lubricated the exposed sides of the pan with baking spray. 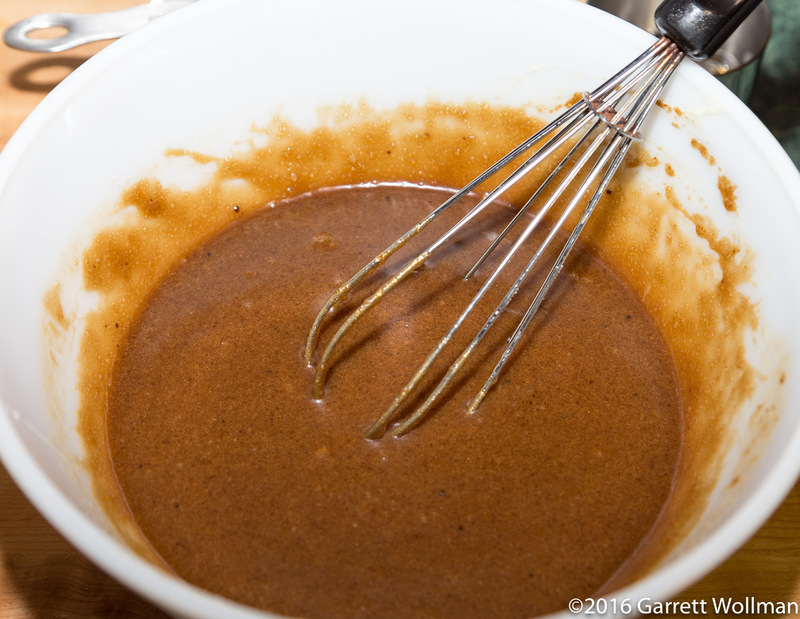 The resulting batter is quite thick and not self-leveling: it must be spread with a spatula to an even thickness in the baking pan. 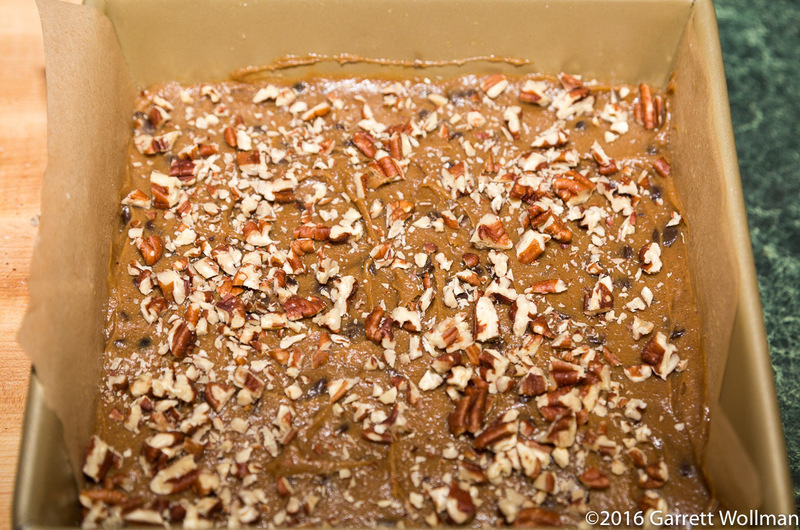 The chopped pecans are scattered evenly across the top of the raw batter, and then the blondies are baked in a 350°F (175°C) oven for 25–30 minutes; they will still be quite soft even when fully baked. (You could probably substitute chopped walnuts if you don’t have or can’t eat pecans, but I wouldn’t advise other sorts of nuts.) Since the nuts are directly exposed to the oven’s heat, there is no need to toast them in advance. 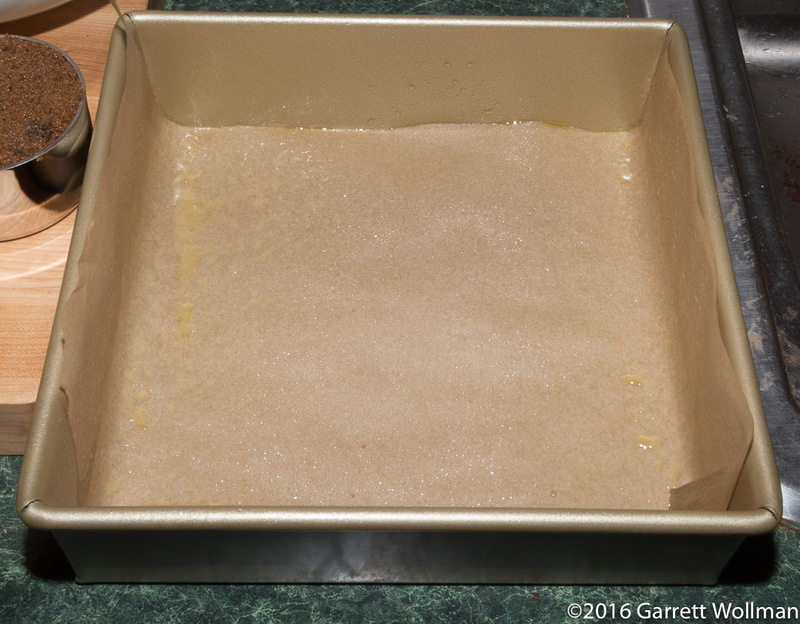 After letting the blondies cool completely on a wire rack (takes an hour or so), they can be de-panned with the help of the parchment sling and portioned. The recipe headnote suggests cutting into sixteen 2″×2″ (5×5 cm) squares, but if I didn’t have to watch my diet, I’d be inclined to make nine 2⅔″×2⅔″ (7×7 cm) squares instead. With the full complement of chocolate chips, these “blondies” turn out incredibly chocolatey — nearly indistinguishable from brownies. They were so gooey that after portioning I stuck the whole batch into the fridge overnight to set up. Although they were still a bit cool after lunch on Monday, I received no complaints. Whether that’s because my coworkers are remarkably uncritical in the face of free food, or because they actually liked them, I’ll never know, but I thought they were pretty good. Of course, I’m inclined to like nearly anything with this much chocolate and brown sugar in it! 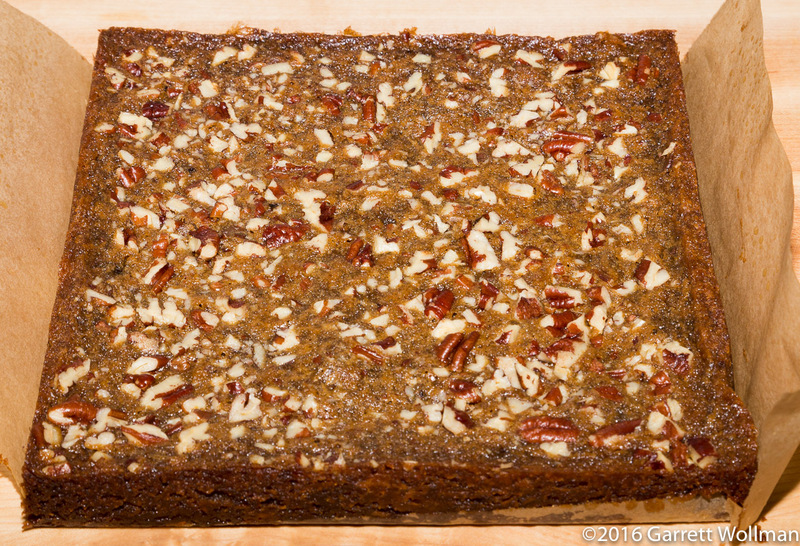 This entry was posted in Food and tagged bar cookies, blondies, chocolate, Ovenly, pecans, recipe. Bookmark the permalink. These look amazing! Lovely pics!